• Inspiration: In an interview, Akimi Yoshida said that the early character design for Ash was inspired by tennis player Stephen Edberg, and the later design was inspired by River Phoenix. May contain spoilers: Ash Lynx, whose real name is Aslan Callenreese, is the charismatic and cough charming hero of our story. When we first meet Ash, he is a infamously tough, street-smart gang leader with a legion of loyal juvenile delinquents at his command. He is curt, rude, blunt, threatens with deadly force in order to get his way, and has... ah, problems with authority figures. But Ash is not to be mistaken for a heartless thug. He lives in a small apartment with an innocent-looking kid named Skip; he takes on the burden of caring for his older brother, Griffin, who returned from Vietnam as an invalid vegetable; and he becomes royally pissed off when he discovers that some of his men are killing for Papa Dino. There's just something about Ash that sets him apart from the thousands of other gang leaders in New York City. Shorter Wong teases him for being "soft," complaining that Ash will never kill another person unless it's an absolute last resort. He is extraordinarily good-looking, which has earned him his share of admirers, but has also attracted the attention of some rather lecherous characters. (Namely, Papa Dino and Marvin.) Even Antonio, a detective for the NYPD, admires Ash. "This kid Ash is as sharp as they come," he tells Ibé. "He united the gangs in this area in no time at all." Antonio and Charlie decisively side with Ash in his conflicts with Marvin, Arthur, and Papa Dino. And, finally, Ash is an equal-opportunity employer. ^_^ The police detectives comment that Ash includes black and Latino kids in his gang, which is highly unusual for a Caucasian leader. Charlie further describes Ash's winning points. "He wouldn't hurt an innocent stranger - not like some punks... Rumor has it he made an arrangement with the mafia. He collects money and transports goods for them. But he's never been caught. He never leaves a shred of evidence. To top it off, he's a master marksman." Indeed, Ash demonstrates numerous times what a skilled sharpshooter he is. At one point, he even threatens to blow Charlie's ear off. "You know I'll do it," he says, grimly and honestly. But Ash is not by any means an ideal person. Much like the lynx that he takes for his namesake, he tends to be loner, who extends his claws threateningly whenever he feels that he is in danger. To be fair, Ash is in danger a lot. But he even goes so far as to refuse aid from sympathetic sources, to act menacingly toward those who are helping him as his friends, and to lash out angrily at the world around him. Ash is incredibly perceptive about the weaknesses and insecuritues of others, and will exploit this knowledge, such as his mean-spirited teasing about Max Lobo's writing skills, in order to keep other people from growing too close to him. It takes a very unique and special person to work past Ash's outer defenses and uncover the real person underneath the toughness and cynicism. Skip can do it, as can Shorter Wong, and especially Eiji. But poor Max Lobo has a much harder time befriending Ash, and gaining his trust and confidence. Antonio and Charlie probably have the hardest time of all. After Antonio extends his sympathies to Ash, Ash reacts by shouting, "Don't touch me! Get your filthy hands off me!" Antonio later comments to Charlie, "I've never had anyone recoil from me like that. It was really as if a lynx had arched its back and hissed at me." If there's one thing that Ash resents, it is being the object of another person's pity. The other thing he resents is involving other people in his own problems. This is why Ash is quick to turn away from the sympathy or friendship of others. He only foresees more innocent people becoming entangled in his dangerous life, and the only logical outcome is that people will be hurt, because they cared for him. Ash adopts his abrasive personality precisely to avoid these consequences. Yeah, Ash sounds like a real jerk. The kicker is that he can ooze charm and grace when he wants to, or when it's to his carefully calculated benefit. One such instance is when he's talking to Max's lawyer, George. "He seems like a sweet, gentle boy to me, Max," George says. Max is quick to counter him. "That wicked feline knows how to make use of his good looks. No one would ever believe he's the leader of a street gang. He could pass for the son of some upper-class family if he wanted to... That pretty face of his throws his enemies off guard." Ash displays a variety of different masks for the world to see. But underneath all that is a lonely and hurting soul. Ash rarely reveals his true feelings, and his true vulnerability, to anyone. Only when he is deeply hurt will he cry. And he does cry, believe it or not. He cries after his brother Griffin dies, and in front of Max, no less. "I wish I could hate you," he confesses. "I need someone to hate." But despite himself, Ash can't stop himself from gradually opening up to Max. Nor can he stop himself from feeling for his cold and callous father. 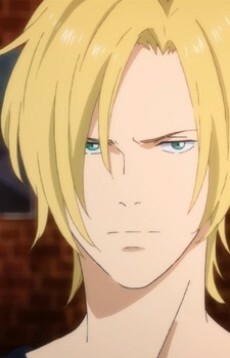 When Ash's father finally sacrifices everything to save his son, Ash cries yet again, despite his obvious disgust at his own emotions. Ash will go to any lengths to protect the people that he cares about. Consequently, he will also go to any lengths to avenge those who would hurt or kill his loved ones. This is why, after the death of his brother, Ash finally decides to take on Papa Dino, to finish off the old mobster once and for all.